Serendipity from Jewels : They CAN Do It!!!! I have always been of the mindset that I needed to teach my children to learn to do things for themselves(I am not going to college with them) and provide them opportunities to do so. I feel like it is never too early to start and so I have went about making my home very child friendly and in the attitude of They CAN Do It!!! Over the course of the next month or so I am going to share the small opportunities that I have given my children in everyday life to feel like they CAN do it and the look on their face when they realize they CAN is priceless and when they CAN do anything it is amazing what they CAN accomplish!!! Breakfast, Lunch, Dinner, and 2 snacks is a big part of young children's day. You almost make your schedule around those 5 things and bed and nap times so there really is no better place to start than mealtimes!!! In my pantry I devoted this shelf below to my children. As you see everything is plastic so there will be no breaking. 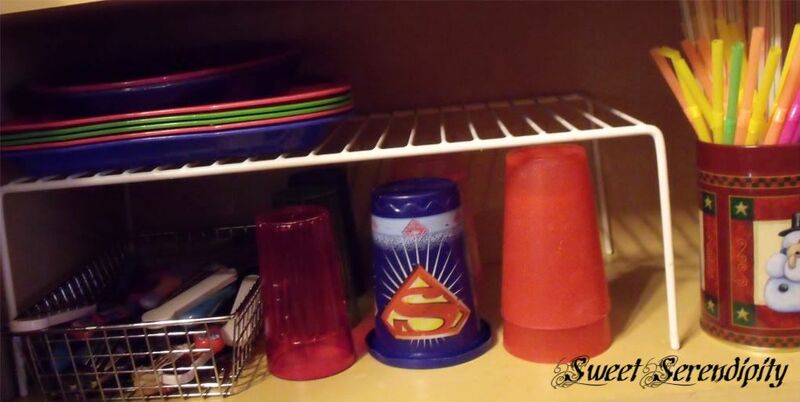 They can get their own cups, plates, bowls(missing in the dishwasher currently), and silverware. They can make choices of color and size. Do they want a straw or not? Do they need a fork or just a spoon? Do you know the question: I am thirsty? That question will disappear altogether with a well placed stool in a nearby bathroom(teach them to use the faucet). Now have I picked up spilt water? Yup they helped the floor is cleaner where that spill was. Have they dumped straws on the floor 100% YES they became paper flower stems. I am not saying they are going to be perfect at these things at first that is unrealistic but over time they master these new skills and feel super about themselves in the process. As an added bonus it makes it easy for them to help me put away their dishes as well after they have been washed.